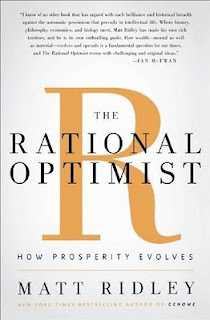 If I could vainly flatter myself with an all-purpose descriptor of my worldview, I’d probably have busted out something along the lines of “I’m a, uh, rational optimist” before the release of this book. The “rational” part of my character is certainly open for debate, and I’ve certainly been party to sky-is-falling pessimism at times. Yet when I saw this book on the shelves a few months ago, it took only a minute of thumbing through it to know it was coming home with me. And to find out that the science writer Matt Ridley, the guy behind other books on evolution I’ve been wanting to read ("Genome" and "The Red Queen"), was the author – well, it sealed the deal. I have long maintained – thankfully on the basis of acres and acres of evidence – that the lot and fate of mankind is rapidly and dramatically improving. This book takes in the great sweep of human history, and lays the cultural and economic groundwork for why. In two words, we humans engendered a quantum leap in our collective well being thanks to two concepts that we eventually stumbled onto: specialization, and trade. We fast separated ourselves from lower life forms as a result. Ridley makes a case so convincing for these two facets of human behavior as being central to our rising prosperity that I truly can’t imagine what the rebuttal might be. Markets are the dominant force in human progress, and have been for hundreds of years. Gains come from exchange of goods and services, which make possible gains from specialization in the creation of those goods and services (your talents are traded for some of my talents until we each have things we couldn’t otherwise make ourselves), which in turn make possible technological innovation. In other words, my quote-unquote specialized expertise in marketing high technology products (! ), and the products that are purchased as a result, is traded for the specialization of others in medicine, art creation, home building, food production and so on. The less friction applied to these exchanges, the better off we are on both an individual and on a collective basis. Like, duh - right? This self-evident fact has a long history of struggle with those who’ve seeked to control and plan markets - emperors, dictators and central planning-driven governments - and with those who’ve looked at rising prosperity and living standards and still found nothing but some new disaster lurking around the corner. Or worse, looked at modern life in all of its dynamic complexity, and found it easier to over exaggerate an idyllic time when people were all self-sufficient in catering to their own needs from their own back-breaking efforts, and were far more happy as a result. As the British Ridley says a few times in this book, “Balderdash”. Someone has probably written a book about the often self-sabotaging and pessimistic nature of humanity and how it fits into the larger evolutionary pattern, and if so, I’d like to read it. Ridley does not discuss something that I’ve also long believed, that our rising standard of living, and the resulting better food nutrition that comes from it, has also helped human to evolve bigger and higher-functioning brains – which continues to perpetuate our collective prosperity and growth as a species. Our innovation perpetuates itself into greater innovation, in search of outsized gains from specialization and trade, and one of the greatest things our chattering classes could do is to embrace this creative destruction and just what it has done for the West and large portions of the East. 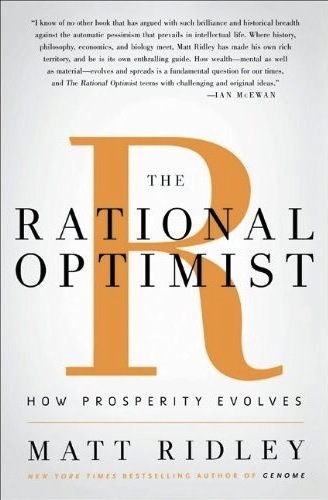 If you think this book is just another survival of the fittest libertarian jerk-fest (it’s not in the least - its scope is as wide as human history itself), or have heard that it’s a climate change denial book, let me say that it’s not – though it does convincingly pour water on worst-case scenarios of all stripes and sizes. This is a first class book of social science, arguing with facts and logic on how we got to be so prosperous and healthy as a people, why that pace is accelerating all over the world, and what we as a species can do to make sure it continues to do so in Africa and elsewhere. Definitely one of the best books I’ve read this year and something that I can see changing and/or strengthening a lot of deeply-held worldviews.